Viget was pleased to recently be a part of the gallery exhibit, Comp DC: A Comprehensive Look at the Design Process presented by the Communication Design Program at Northern Virginia Community College in Alexandria, Virginia. It was a great chance for us to connect with local design students, tell the behind-the-scenes story of what goes into a design, and to see our work in print and presented in style! Four local design agencies were asked to participate and show off their design process. 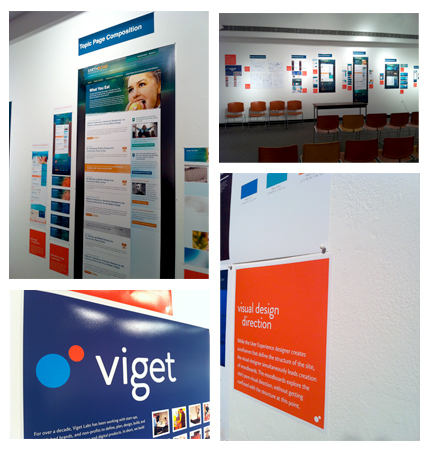 Viget was there to explain the interactive side of design from the point of view of a DC Digital Agency. We chose the recently relaunched EarthEcho as a good example of the typical design process here at Viget. The exhibit showed every step of the design process that we went through with EarthEcho, from wireframes and moodboards, to final page designs. 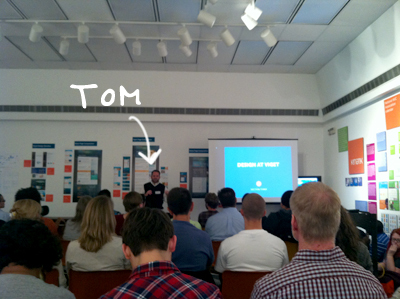 As part of the exhibit opening last week, Tom presented to a gallery full of interactive design students about the ins and outs of the EarthEcho redesign, and web design at Viget in general. The students were a great audience and it turned out to be an evening of good discussions, meeting talented folks, and general fun and merriment. The exhibit itself will be up at the Tyler Teaching Gallery at NOVA's Alexandria campus from September 27 - October 20.